All of my craft room is in shambles over at the new place, nothing is organized, and I still am stuck here at the old place with no supplies. Let me tell you, it can drive a person nuts. But I thought I'd post a collection of owl projects I've done over the past year. Aghhhh! Moving! No time to craft!!! Sorry to everyone for the lack of updating. I should be getting back to my normal crafting schedule in two weeks or so. Anyhoo, TODAY IS MY BIRTHDAY! 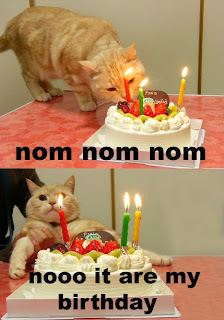 And to celebrate, here's my favorite lolcat. Happy Sunday! So, the women in my church are making blankets for Project Linus for this year's ongoing service project. A bunch of fabric and yarn was donated to us that needs to be sewn, knitted, and crocheted into blankets. I'm working on crocheting a blanket, but it's taking a long time, so I thought I'd try my hand at sewing. Now, this is my first blanket ever, so I guess I kind of have an excuse, but.... I didn't even think about seam allowances and the blanket kind of just kept getting smaller. So it only ended up being 32''x26" instead of 39''x32". FAIL. I'm reasoning that it's not a complete loss, because it cooould be used for a newborn baby. Anyways, I sewed on a little kitty cat to add a personal touch. I'm overall happy with how it looks and how it turned out. If only I had thought ahead and had it turn out bigger, I'd be 100% pleased. Well, at least I learned something. Hopefully, I should be done with my crocheted blanket of the correct size in 3 weeks or so. I want to try to make at least one blanket for every month this year. Well, we get the keys to our new place tomorrow, so we're going to be starting the moving process. I probably won't be updating as often as usual over the next 2-3 weeks which is a bummer. I'm pretty excited to be able to re-organize my craft stuff into my new craft room, but not too excited for much else moving-related. It's an ATC! Blargh, I ate all junk food today and am feeling on the verge of a crash, hence the "not-my-best-effort" post.... Good night! Hey everyone! This is just a reminder to keep on voting every day for my artwork in the Dangers Of Debt Contest! I'm currently in 13th place only 158 votes away from 1st place. I've been planning on doing a woven fatbook page, and today was the day. I made this little guy this morning. He's got elements of other monster plushies I've made and sent away, so it will be nice to have this one as a permanent fixture in my fatbook that I definitely won't be sending away. After stitching on the face and mouth, the back of this page was a mess of embroidery thread (grrrr, for not thinking ahead) so I took my last loose beaded butterfly and slapped it on with hot glue. Problem solved. Here's an early progress shot of the weaving. I just used a piece of cardboard with some slits cut into it and pieces from my trusty scrap bin. If anyone wants to try this, make sure there are an odd number of column-strings. If there's an even number, the whole weaving thing just...doesn't happen. Dunno how to explain it... Anyhoo, happy Thursday! Only 4 days until Valentine's day! My husband and I don't usually make a big thing about Valentine's. He's so sweet all the time that it doesn't matter :) Plus my birthday is this month, too, so I get spoiled enough. I was in the mood to paint a little birdie tonight, so I thought I'd turn this one into a little burlap Valentine! He doesn't often check this blog, so I think the surprise will be safe even as I post this tonight, but when he asks what I made in the morning I'll just have to say, "meh, nothing..."
Does something look familiar? :) I recreated my little red matryoshka plush for a fatbook page! This way, if I ever sell the stuffie, I'll still have her in my fatbook. She's made of red angora sweater, felt and thread. Here's the page. Unfortunately, she's leans a little to the right on the page... Poor planning on my part. Oh well, I still think it's cute enough! The back is buttons. The smell of the burlap background fabric is so nice... wheaty and burlappy. I love how fatbooks stimulate so many senses! Here's the whole fatbook so far. Considering its fatness with 5 pages up to this point, I think I'm going to end up making it 10 to 12 pages total, not including what will be the cover. Today was an INSANE day. I won't go into it, but this morning, I thought that the most interesting event of the day would be painting my toenails. I was WRONG. 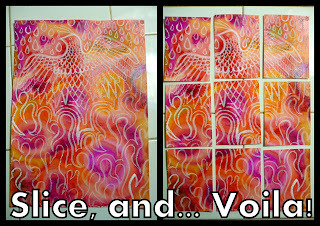 Here's what the original phoenix painting looked like before and after I sliced it to ATC size! It was nice to have 9 ATC bases made all at once. This one is my favorite! It was based on a bicycling theme. He looks familiar, right? The original is green, but I just HAD to make another for this card. The raindrops look cooler in person... They're coated in heavily reflecty sparkly microballs. My other favorite for the chunky theme. Buttons! I hard time sending this set off, because I really liked how they all came together! Other themes I used were human anatomy, Metalocalypse, June Palmer, & gothic arches. So fun. I hope everyone has a beautiful and happy Saturday! I took 6 of the 8 and glued them into my board book! I love how they look all lined up in there... I can't wait till my book is all filled with fun artsy paper things.